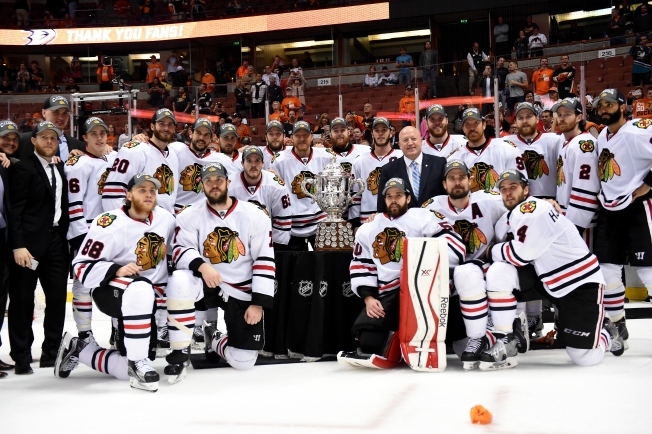 The Chicago Blackhawks advanced to their third Stanley Cup Final in six seasons on Saturday night as they knocked off the Anaheim Ducks by a score of 5-3. Jonathan Toews scored twice to kick off the game, and Brandon Saad, Brent Seabrook, and Marian Hossa all scored goals as the Hawks advanced. The Blackhawks will face the Tampa Bay Lightning in the Stanley Cup Final, which will begin on Wednesday night in central Florida. The Ducks came out early with a solid start, but Chicago quickly rebuffed the advances and scored to take an early lead. Duncan Keith made the play happen as he pushed the puck up ice to Patrick Kane, and the winger eventually found Niklas Hjalmarsson at the point. The defenseman’s shot was stopped by Frederik Andersen, but Jonathan Toews was there to pound home the rebound and give the Blackhawks a 1-0 lead. The Blackhawks continued to dominate the game from a tempo perspective, jamming up the neutral zone and stopping the Ducks’ forwards in the offensive zone, and they were rewarded with another goal. On a power play, the Hawks swung the puck around the zone, and Toews got a shooting lane near the top of the face-off dots. With Andrew Shaw screening, Toews ripped a shot over Andersen’s glove, giving Chicago a 2-0 advantage with about eight minutes to go in the period. The Ducks did make a late push to end the first period, with Ryan Getzlaf getting a quality chance alongside the goal following a nice possession, but Corey Crawford parried away all eight Anaheim shots in the frame as the Hawks kept their advantage after 20 minutes of play. If the Ducks were hoping to jump out to a hot start in the second period, they were sorely disappointed as Chicago scored again to extend their lead. After a puck skipped along the ice off the boards, Kane settled it down and shoved a pass across the ice to Brandon Saad. Seeing Kane loading up, Andersen locked in on him, and Saad got a wide open goal as a result to make it a 3-0 advantage for the Blackhawks. Continuing to push, the Blackhawks refused to let up, and they scored again later in the period. On a 2-on-1 rush, Brad Richards put a shot on goal that Andersen stopped, but Marian Hossa was there to clean up the mess as his skate knocked the puck into the goal and put the Hawks up by four goals. After a couple of penalties made it a 4-on-4 situation late in the period, the Ducks finally got on the board. Ryan Kesler did the honors for Anaheim as he got the puck along the goal line near the boards, and his shot got up over Crawford’s shoulder and just under the crossbar to give the Ducks some life. The third period kicked off with some small rumbles of life from the Ducks, but it took quite a while for the team to finally get in gear and put one in the net. With about eight and a half minutes to go, Ryan Getzlaf beat Johnny Oduya on a rush up the ice, and he passed to Patrick Maroon. The winger then slid a pass over to Corey Perry, and he hammered home an easy shot to make it a 4-2 game. Just over a minute and a half later, the Blackhawks answered back with a power play tally of their own to put the Ducks in dire straits. After some good puck movement, Shaw got back to the front of the cage for a screen, and Brent Seabrook took full advantage and hammered a shot just inside the far post to make it 5-2. The Ducks did get a power play goal late in regulation time, but it wasn’t enough as the Blackhawks picked up a road win in Game 7 and advanced to the Stanley Cup Final. That series will begin on Wednesday night in Tampa Bay, with puck drop scheduled for 7 p.m.